LTHForum.com - Recent Paris Recs? LTH Home > Chat > Beyond Chicagoland > Recent Paris Recs? So I haven't been in 20 years (not that Paris changes all that much), but am going for a whirlwind 3 day birthday trip without children. Not looking to do anything too expensive. We are staying near the Opera and will be there over a weekend, so Friday, Saturday and Sunday. I made a reservation Friday at La Bourse et la Vie fairly early since I will likely be jetlagged. I also made a VERY late night reservation Saturday at Le Chateaubriand (mentioned in another post) that I am kind of so so about since reviews are so mixed. It's also quite hard to find places that are open on Saturday and Sunday, and I am trying to avoid tourist traps. I speak French, which generally helps with the service levels and I know my way around the city pretty well since I spent a lot of time there in the past. One thing I was thinking we might enjoy one of the Paris by Mouth tours of either the Marais or the Left Bank, but I am partially wondering since we only have three days if I should just do my own tour of some of the markets, I have never been to Marche Aligre for example. Also am planning to do Angelina for hot chocolate one afternoon since that is a family tradition. My husband and I spent a few days in Paris in early January, and we did the Left Bank PBM tour. The guide was a charming young woman from Australia who's a professional baker, and we thoroughly enjoyed it. For meals, our favorites were Verjus (our biggest splurge meal), Astier (neighborhood bistro), and La Regalade for a wonderful lunch. After two recent trips to Paris (November '17 and February '18), I'd happily recommend Restaurant Le Duc in the 14th for lunch. I've twice had their set menu at lunch (plus a few additions) and couldn't be more in love with this restaurant. For around 55-65 euro, you'll have four courses of masterfully prepared, perfectly fresh fish and seafood. The restaurant interior - unchanged since the 1960's is (in my opinion) beautifully retro. Lunch atmosphere is relaxed and semi-hushed with a few tourists, a few business lunches and a few family celebrations going on. Service (once again, for us) was spotless - proudly professional but genuinely friendly. Once again, the set menu is a fantastic value. Take the opportunity, though to add a treat or two. 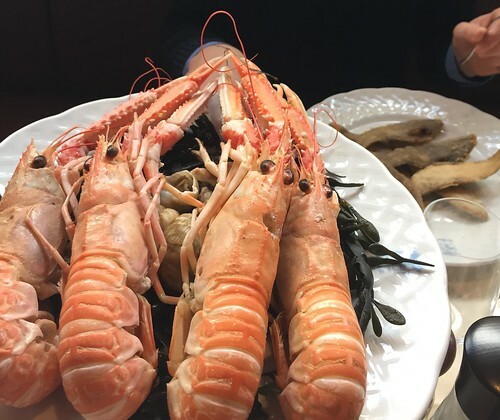 An order of "Langoustines mayonnaise", while 60 euro, yields 4 perfectly steamed, perfectly fresh specimens, each the size of a baby's forearm. Thank you both so much! Those langostines look amazing. We go to Paris about twice a year and have our favorite restaurants-seems like you have everything covered except for Sunday night. We have not tried La Rotisserie d'Argent yet, but we are going to try it on our next trip. It comes recommended by David Lebovitz-and I've never disagreed with any of his recommendations and they're open on Sundays. https://tourdargent.com/en/la-rotisserie-dargent/ I know that La Fontaine de Mars is open on Sundays also, but it can be a little touristy. We also love Astier, Pirouette, Chez la Vieille (another one of Danny Rose's places), Le Souffle near place Vendome is great for lunch, Le Coupe Chou is a small quiet place. Try to stop for drinks at Cafe Laurent in the Aubousson Hotel. They have live jazz and the place is so cute. You will love La Bourse et la Vie. Their french fries are the best! We also love going to the March au Puce - the flea market. It's open on Saturday, Sunday and Monday-so you could go one of your days. We did a Fat Tire bike tour one afternoon and it was fun to explore the city by bike. If you haven't been to Paris in a while, that may be fun. It's also very interesting to go to Père Lachaise Cemetery and walk around-not as creepy as it sounds. Since you only have 3 days, I will stop! [quote="Diane"]We go to Paris about twice a year and have our favorite restaurants-seems like you have everything covered except for Sunday night. 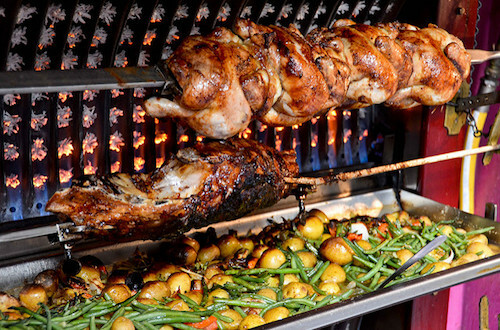 We have not tried La Rotisserie d'Argent yet, but we are going to try it on our next trip. It comes recommended by David Lebovitz-and I've never disagreed with any of his recommendations and they're open on Sundays. [url]https://tourdargent.com/en/la-rotisserie-dargent/[/url] I know that La Fontaine de Mars is open on Sundays also, but it can be a little touristy. Thank you so so much! I was thinking of checking out the March au Puce!! I went to Pere LaChaise years ago and thought it was so interesting, so maybe I will take my husband since I don't think he's ever been. Glad to hear about La Bourse et la Vie, now I am doubly excited. I was wondering if La Fontaine de Mar was touristy (was kind of assuming so since every reference includes "the Obamas ate here! ", but it looks charming). I will check out La Rotisserie d'Argent, hopefully it is not as price as its sister restaurant. Your other recs looks awesome too!! I went to Le Souffle years ago and loved it, so glad it's still great! I so appreciate your suggestions!! These may or may not be valuable depending on where you are staying and what you are looking for. Restaurant Pouzenc -- 67 Rue de Charenton, Bastille. Perhaps our favorite meal of the trip. Small neighborhood restaurant. Delicious and friendly. Restaurant Histoires -- 85 Avenue Kleber, Trocadero. Michelin two star. Exquisite service. Just read that the chef has left residence, so I would wait for a recent review before booking. If you go, I would consider the four course option over the full degustation, as we found it to be too much food by the end. If you're in the mood for pastries, I recommend stopping at one of Cyril Lignac's shops. He's a celebrity chef, but it's not all show; those pastries really are as delicious as they look! raydle wrote: I made a reservation Friday at La Bourse et la Vie fairly early since I will likely be jetlagged. My wife and I dined at La Bourse in November. Great meal. She had the steak au poivre, I had the lamb. The lamb was very good but I'd get the steak if I dined there again. A couple minutes' walk from La Bourse is our favorite restaurant in Paris, Juveniles. It's run by a Scottish expat and his French-born daughter and son-in-law. There are a few signs of the Scottish influence -- there's haggis on the menu and the wine and cheese lists are more international than at most restaurants, but the rest of the menu could be found at any bistro. The food is much better than you'll find at most of those other bistros though, and reasonably priced, as is the wine list. We liked the place so much we ate there twice during our visit, the only restaurant to have that distinction. I can't recommend it enough. And finally take your haul to one of Paris's gorgeous parks in the early evening and enjoy - I recommend Square du Vert-Galant which is a popular student hangout . Thank you all for your recommendations. It was a bit of a whirlwind of a trip and I didn't snap too many pics, but it's hard not to eat well in Paris. I arrived solo and my hotel room wasn't ready so I headed over to Angelina for a hot chocolate and a snack. It was packed with tourists, but the hot chocolate was still delicious as ever. I grabbed a few macarons from Laduree while I was meandering. They got a little crushed in my bag but they were still delicious when I finally ate them a couple hours later. I wasn't sure what time my husband was arriving or how exhausted I would be, plus our plans had shifted by a day, so I didn't have reservations for night, but the hotel recommended Au Petit Riche, which was a traditional old school bistro. The service was great, our waiter was very friendly and the food, while not amazing, was solid. We started with the foie gras and razor clams, my main was the lamb and my husband had a pork chop. The wine was delicious, I had a red sancerre that I really enjoyed. We did a Paris by Mouth tour of the Marais on Friday, which was so much fun and so delicious. We stopped at a fabulous boulangerie, a chocolate shop (jacques genin), a cheese stand and a charcuterie traiteur, ending in a wine shop where we ate all our goodies. We were pretty full from that, so no need for lunch that day! That evening I had a reservation at La Bourse et la Vie. The foie gras starter was amazing, we also loved the leek starter, I did the Pot au Feu de Veau and my husband did the Steak Frites with the au poivre sauce, both were very good, mine was certainly a lighter dish. I loved his fries and sauce. This may have been the best meal I've had anywhere ever. We loved every course and it finished with an amazing chocolate souffle. The wines were perfectly paired. The service was amazing and friendly and fun. The last day we were feeling like something a bit different so went to Bonjour Vietnam in the 7th for a delicious vietnamese meal. It's a hole in the wall right by the Pantheon but I loved it, highly recommend.